Talk about balance—Alicia Zito isn’t just 2015’s Eastern Cheer & Dance Association’s “Cheer Coach of the Year,” but also a choreographer, judge, mom and a full-time attorney. When not practicing law, Zito runs the Reading, PA-based gym Rebels Elite, which currently has just over 90 athletes. CheerProfessional caught up with Zito between the court and the competition mat for a candid Q&A session. You took over the Rebels All-Star program and named it Rebels Elite in 2013. How does the new program differ from the old one? Zito: They were small, almost like a prep program, in a tiny facility with no equipment. The athletes were ready to be more involved in the competitive cheer world. The old program was really economical [in order] to get the kids in the community involved in cheering; we don’t live in a very wealthy area. We wanted to give kids a chance to participate in something like this, without all the high-end costs. And I still try to stay true to that today, even though we’re now on the national circuit. We’re one of the lower-cost programs in the area. Like many cheer professionals, you hold down a full-time job outside the gym. How do you balance being an attorney with running the gym? Zito: My schedule is tight, but I make time for it because it gives me an outlet for my high-stress job. I’ve always coached cheerleading, even when I was in law school. I needed something to break up my day from studying, and I can’t pull myself away from it. I enjoy it so much. It is stressful running an all-star program, but to watch the kids learn and grow and have fun is my release. Your tagline reads, “Family means no one gets left behind or forgotten.” How important is it to you to have that family feeling among your students? Zito: I’m a gym owner who’s really involved with the kids. I know them and their families. I know what they’re doing at school and what they’re involved in. You’re dealing with primarily a lot of high school girls, and with that comes the typical teenager issues and school issues—and the fights and the bullies. We try to circumvent all that and keep the kids positive. The kids will talk to me about whatever they need to. I really think the kids can learn and grow in a family environment, and like in any family, we hold them accountable for what they’re doing. We have our good days and bad days, but at the end of the day we’re still family, and everybody has to understand that. You pull together when you’re a family, and that’s how you win. That’s how you succeed, that’s how you learn to grow. What’s your advice to teams deciding whether to hire a choreographer or do the choreography in-house? Zito: If you’re doing it yourself, you need to be knowledgeable about the new rules and scoring grid, because every year it changes. Every year, you have to be on top of the game, performing the elite skills and sequences in order to stay competitive. If you’re able to do that in-house, it’s great, because you know the kids best. You know their abilities, and you can work with the routine. But there’s something to be said about having an outside choreographer bring their fresh ideas and creativity to the program. 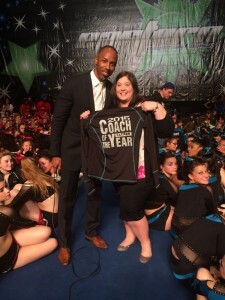 [Those who] have worked for high, nationally-ranked Worlds teams are able to give you that extra bit of flair that you may not be able to get yourself.